More than 70 locals met on 18 October for ‘Creative Eltham – Developing the Arts’ – a conference designed to showcase the creativity and passion for the arts in Eltham. 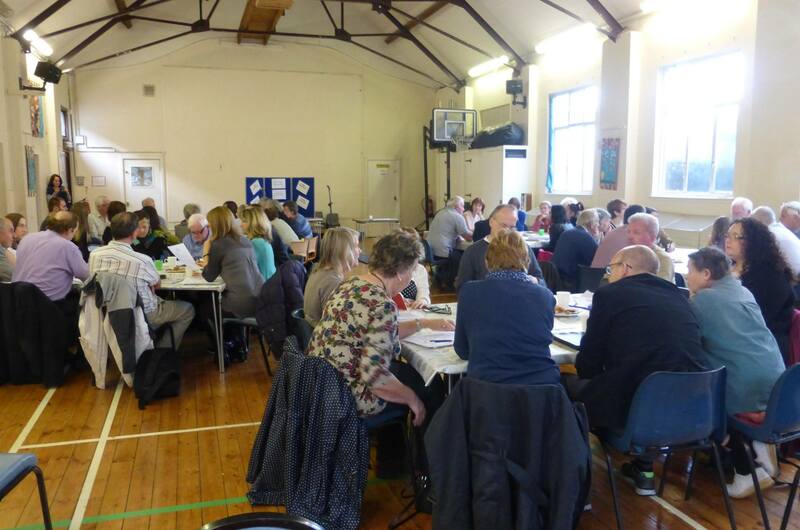 Organised by Eltham Arts, the conference was held at The Friendship Centre in Glenure Road, and featured an afternoon of arts-related discussion and activity. The event began with three keynote speakers, the first of which was Miranda Williams, cabinet member for Culture and Creative Industries, Royal Greenwich Council. Williams said that Eltham has a “thriving arts community, which the council is keen to support”. She detailed arts activity supported and undertaken by the council in Eltham so far this year, which included the summer music festival at Passey Place, organised in association with Eltham Arts. Williams agreed that activity such as this “helps to animate our town centres and provides opportunities for artists and audiences to come together and promote community events.” Williams concluded by encouraging local arts organisations to apply for the council’s Community Arts Fund. “The fund encourages partnerships between established organisations and the community, and I encourage you to apply,” she said. She also recommended listing arts events and organisations on the council’s directory. Apply for Greenwich Council’s Arts Fund. Dr Heather Lilley, senior lecturer drama, University of Greenwich, then took the stage to discuss reminiscence theatre – a technique that involves producing pieces of theatre from memories. In 2012, the university acquired an archive of reminiscence theatre productions created between 1983 and 2005, and have been using them with their students ever since. The material is used to create theatre from memories with the elderly in mind, which inspires audiences to link back to a time when their lives were perhaps fuller and involved new experiences. This type of theatre also encourages interaction between young and old people. As a result of the work undertaken, the university has toured nine care homes in Greenwich and Woolwich, and hopes to extend this initiative. “It’s purely a positive experience for both groups,” said Lilley. “The performers and audience chat afterwards, and have a meaningful conversation prompted by particular subjects in performance, not just stories, real memories, real lives. There is a real responsibility to students to express the memories as authentically and as truthfully as possible.” Lilley encouraged attendees to visit the (free to access) archive and use the material. “There’s no reason why reminiscence theatre cannot be brought to Eltham,” she said. The final speaker of the afternoon was Amy Ash, learning and participation curator at the Gerald Moore Gallery. Ash explained that although the gallery operates in collaboration with the school, it’s also a service to the community. She detailed several projects that have been undertaken by the gallery this year, which included a weekly arts outreach programme facilitated by Eltham College’s sixth form students, where local primary schools were visited. “We’ve already seen a difference in engagement here,” said Ash. The gallery also facilitated a series of talks which culminated in an exhibition, and are working with local organiastions (including Eltham Arts) to create other new opportunities for the community. After some networking, attendees broke into groups to discuss several areas affecting the arts: health and wellbeing; business and regeneration; funding and development; publicity and marketing and arts for all. The discussions were then summaried and fed back to the whole group, and will form a blueprint for Eltham Arts’ activity going forward. View photos from the Eltham Arts Conference. The next Eltham Arts event will be the launch of our Tales of Eltham book after the successful short story competition earlier this year. The launch will take place on 1 November 2014 from 2.30pm at Eltham Library. For more details, contact us.